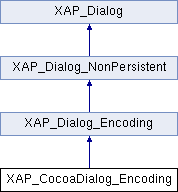 References XAP_Dialog_Encoding::_getAllEncodings(), XAP_Dialog_Encoding::_getEncodingsCount(), XAP_Dialog_Encoding::_getSelectionIndex(), gchar, m_dataSource, m_dlg, and s.
References XAP_Dialog_Encoding::_getAllEncodings(), XAP_Dialog_Encoding::_setAnswer(), XAP_Dialog_Encoding::_setEncoding(), XAP_Dialog_Encoding::_setSelectionIndex(), XAP_Dialog_Encoding::a_OK, and m_dlg. References _populateWindowData(), XAP_App::getStringSet(), LocalizedString(), m_dataSource, m_dlg, and XAP_Dialog::m_pApp. Referenced by _populateWindowData(), and runModal(). Referenced by _populateWindowData(), event_OK(), and runModal().